December 14, 2015, 10:50 a.m.
Donald Trump invited widespread condemnation from across the political spectrum, including fellow Republican candidates for president, after he called for a ban on Muslims travelling to the United States. Jeb Bush called Trump &apos;unhinged&apos;, while the Obama administration called the comments &apos;morally reprehensible&apos;. The call for a ban on Muslims traveling to the United States came after the killing of 14 people by a Muslim married couple in San Bernadino, one of whom had recently immigrated to the United States. Research from YouGov shows that Americans narrowly tend to agree (45%) rather than disagree (41%) with Trump&apos;s call for a ban on Muslims entering the United States. Respondents, who were not told in the survey that the statement was made by Donald Trump, differed significantly according to political affiliation. A large majority of Democrats (59%) rejected the idea of a Muslim travel ban, though 29% of Democrats do agree with it. Over two-thirds of Republicans (69%) endorsed the idea, and only 25% disagree with a Muslim travel ban. 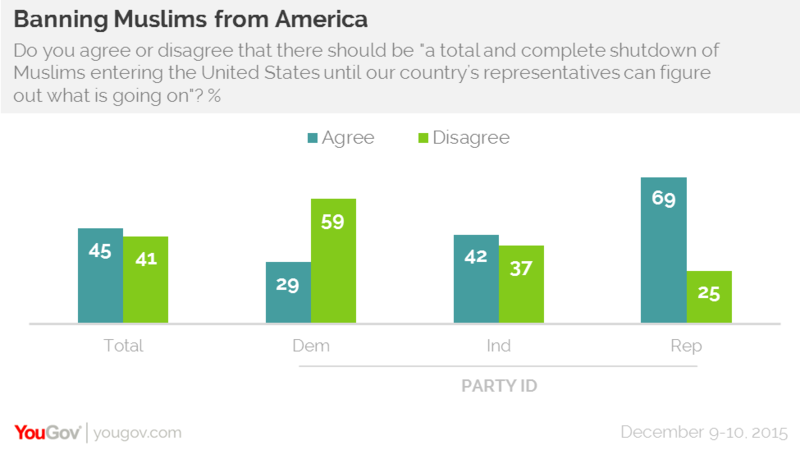 Independents were divided, with 42% agreeing and 37% disagreeing with a potential ban. Trump&apos;s statements on Muslim travel have not significantly changed public opinions towards him. In a survey conducted November 19th to 23rd, after the Paris attacks but prior to San Bernadino or the call for a Muslim travel ban, 55% of Americans had an unfavourable view of Trump while 38% had a favourable view. 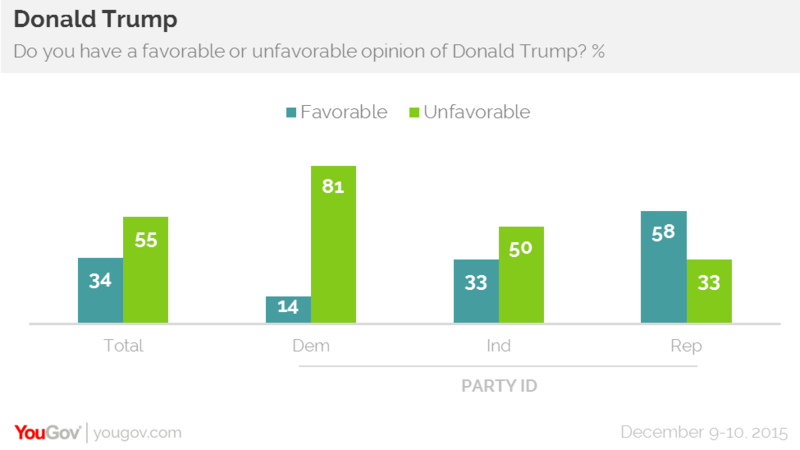 55% of Americans still have an unfavourable view of Trump while his favourables have dropped somewhat to 34%. Criticism of Trump also spread outside of the United States, as his claims about no-go areas in London led London&apos;s mayor Boris Johnson to say that &apos;the only reason I wouldn&apos;t go to parts of New York is the very real risk of meeting Donald Trump&apos;.